Inspired by the popular plan 3945 and requests for developed basement space, this plan incorporates a walkout basement with ample doors and windows. A large wraparound deck provides access to a generous vestibule or french doors to the living room. Arranged over three floors, the main level boasts a vaulted living room open to the upper level, and open concept floor plan. The main floor master bedroom enjoys an adjoining bathroom with integrated laundry and generous walk-in closet. Upstairs, two bedrooms share a shower room and the basement includes another generous bedroom with walk-in closet (or optional recreation room). A large mechanical/storage room tops off the owner’s amenities. The daylight basement bachelor suite boasts large windows, garden doors, a fireplace, kitchen with dinette and bathroom with integrated laundry. This model is ideal for sloping lots and the basement bachelor suite is attractive as a mortgage helper or inlaw suite. An alternate version without the bachelor suite and 5 bedrooms is available in model 3956. Looking for other plans with mother-in-law suites or basement apartments? Check our Mother-in-Law Suite Plan Collection and House Plan with Basement Apartment Collection or , or Create a “New House Plans – Latest Trends” Alert to receive all of the latest designs direct to you by email! 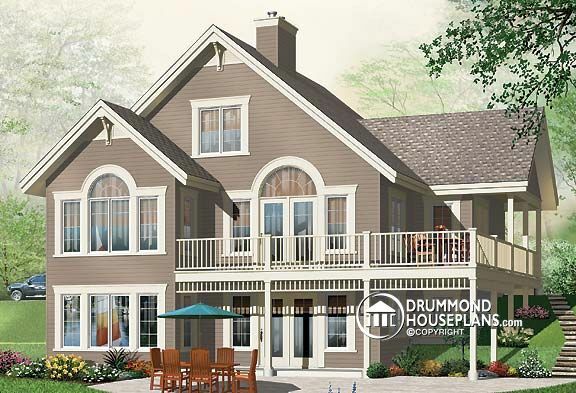 Thanks for visiting the DrummondHousePlans Blog!